I recently finished reading The Book of Negroes by Lawrence Hill. My good friend, Sharon, had given it to me a few months ago and I wasn’t quite sure what to expect. It was an outstanding novel…and shocking. Prior to reading it, I had very little concept of what slaves endured. I mean, really endured. I certainly had no clue of what it was like to have been abducted from a village in West Africa and forced to walk months to reach the sea, only to be crammed into an overcrowded, rat-infested ship with all your friends and family dying around you – if you were lucky enough to still have them with you – and then sailed to a foreign land where you were sold at an auction. And then the real hell of your new life began – if you survived, that is. Such was the journey of Meena, the 11-year old protagonist of The Book of Negroes. She could teach us all a thing or two in the tenacity-department. The Book of Negroes was an important historical lesson for me but it was Meena’s story that made history come alive – and provide meaning to my own life today. And isn’t that what good fiction does? I must confess to have avoided watching films about slavery because I find them extremely upsetting. But I realize now that sticking my head in the sand about what happened in recent history is a dishonour to the millions of people who had no freedoms whatsoever. As a Canadian woman in 2015, I am blessed beyond belief to be living where I do, when I do…and The Book of Negroes was a powerful reminder of that. The book also gave me a bit better understanding of the racial tensions that run so deep in many parts of the world today. For I suspect atrocities such as the slave trade live on at the soul-level. How could they not? 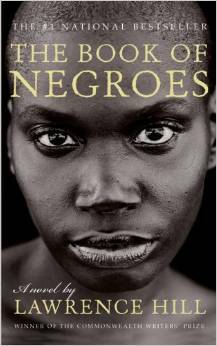 If you haven’t yet read The Book of Negroes, I highly recommend it. If you belong to a book club, this novel would generate some excellent discussion…at least, I certainly hope so. Maryanne Pope is the CEO of Pink Gazelle Productions and Chair of theJohn Petropoulos Memorial Fund. She is the author of A Widow’s Awakening and the playwright of Saviour. If you would like to receive her weekly blog, please sign up here. I’m currently reading “Black Ice” the story of Val James the first black man to play in the NHL. Racism was certainly prevalent in the 80’s when James played. Wonder if the black players at the World Juniors still suffered taunts. Hope The Book of Negroes will be widely viewed. Read it quite a while ago. Worth a reread. Perhaps some day things will change. Yes, it was a great read and generated much discussion in our book club. I suspect it was a bit light in the real violence, sexual and otherwise, that slaves were subjected to. I never knew of Canada’s history in the slavery era and for me this was very enlightening. **News: The Book of Negroes six-part miniseries Will Air on in Canada for six consecutive Wednesday nights on CBC TV, beginning tonight January 7, 2015. In the U.S.A., broadcast is scheduled on BET at 8 pm on February 16, 17 and 18, 2015. The miniseries was co-written by Lawrence Hill and director Clement Virgo, and features actors Louis Gossett Jr., Cuba Gooding Jr., Aunjanue Ellis, Lyriq Bent, Ben Chaplin, Allan Hawco, Jane Alexander and Greg Bryk. Filming took place over 66 days in 2015 in South Africa and Canada. The series is produced by Conquering Lion Pictures. No if only I had a PVR I might be able to watch it all. MA – I read this book a couple of years ago and also loved it! FYI – The Book of Negroes, a television adaptation of Lawrence Hill’s book, makes its television premiere on CBC on Jan. 7 (tonight). It’s a 6-part mini-series starring Lou Gossett Jr and Cuba Gooding Jr. I read “The Book of Negroes” a few years ago and was also deeply touched. The thing that I love about historicals is that they are a perfect blend of fact and fiction and because the characters come alive it actually helps us remember the real facts. There’s a TV debut movie based on the book tonight, I believe, on CBC. Enjoy! I heard there was a mini-series about the Book of Negroes, Jan…I have no doubt it will be amazing! Ooohh…the book, Black Ice, sounds really interesting, Marjorie! I was a little confused about if Meena loses her belief in her God, can someone explain how she uses her faith to help her endure her struggles!? !